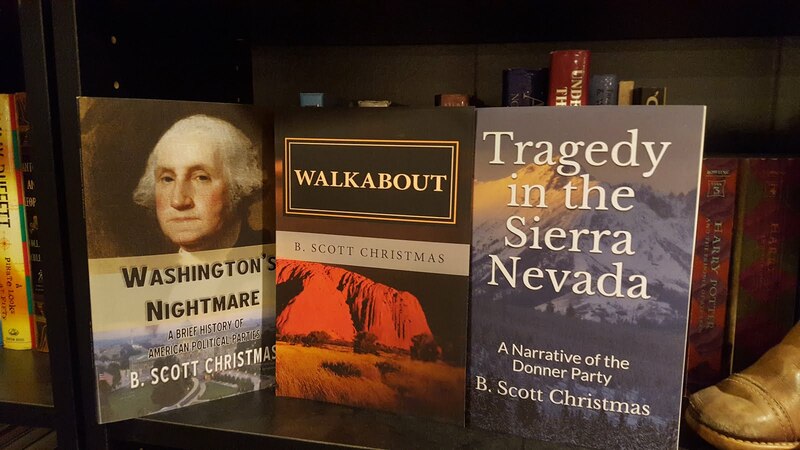 My plans for 2013 include losing weight, quitting smoking permanently (I've had way too many false starts), and finishing my book on political party history in the United States. We'll see how I've done come next December. Well, two out of three ain't bad. Funny thing is, if you'd asked me last year, when I made that post, which one I thought would be most likely to get accomplished, it would have been the book. Turns out, that's the only goal I didn't reach. I stopped smoking cigarettes on December 30, 2012 (or maybe it was the 29th? - either way, over a year ago now). I began using an e-cigarette exclusively after that, and gave up the e-cigarette (and thus nicotine) at the end of March. I can say with a very high degree of confidence that I will never be a smoker again. In January, in an effort to follow through on the above-mentioned plans for 2013, I started making some dietary changes and started doing sets of sit-ups and push-ups every day. Not surprisingly, this lasted until the first part of February and then began to fade. I did lose 10 or 12 pounds, but once I started drifting back to my old habits, what little weight I lost began to return. 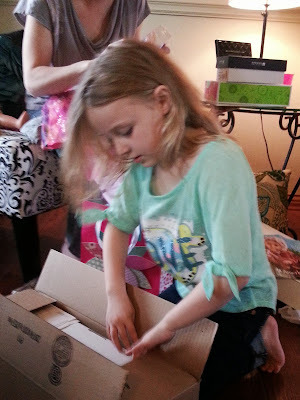 In January, we also celebrated my oldest daughter's 11th birthday. 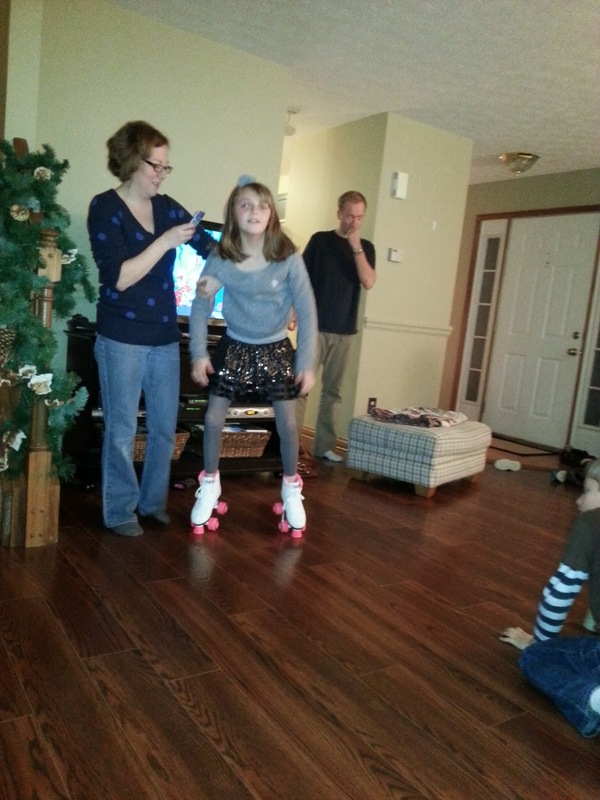 Her favorite present was roller skates, which smell like band-aids, even a year later. I've written a number of times about my heart attack and don't feel the need to rehash it all here. If you want to know the details, read this: My Life-Changing Saturday. I was more than 50 pounds overweight, but I looked about 100 pounds overweight in this picture. Double chin city. 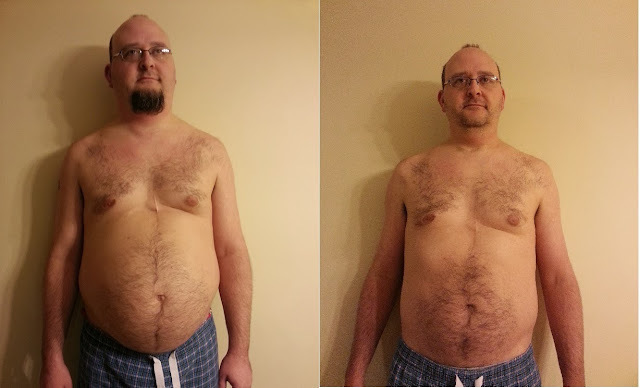 I had the heart attack on March 23, and after that I made radical and immediate changes to my lifestyle. Beginning that weekend in the hospital, I gave up caffeine and nicotine cold turkey. I stopped drinking soft drinks (except for an occasional diet caffeine-free). I gave up fast food. I began tracking my daily calorie intake and exercise routines, and began eating a largely fruit- and veggie-based diet. I cut meats down to just a few percentage points of my overall weekly caloric intake, and cut red meat down to where it's basically just an occasional treat. I lost weight quickly and steadily and by October I had gotten down to 199 pounds - over 50 pounds from where I was at the beginning of the year. My cardiologist had told me after my heart attack that he wanted me "under 200 pounds," so hitting 199 was a big deal. Because of my heart attack, we didn't go on vacation this summer with the rest of my wife's family - like we usually do. I was not, at the time, up to making a long trip. Instead, the best we got for a vacation was a few trips down to her parents' lake house. Unfortunately, even those trips were not particularly restful - at least not for me - because I was anxious the whole time. I guess it was a sort of agoraphobic thing: I didn't like being away from my comfort zone at home, and, more importantly, my hospital and cardiologist. 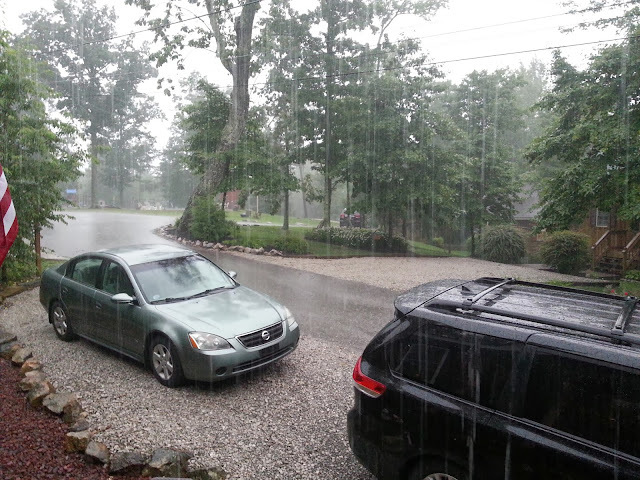 It also rained both times we were there. In May we celebrated my younger daughter's birthday. She got a doll with a broken leg and crutches. 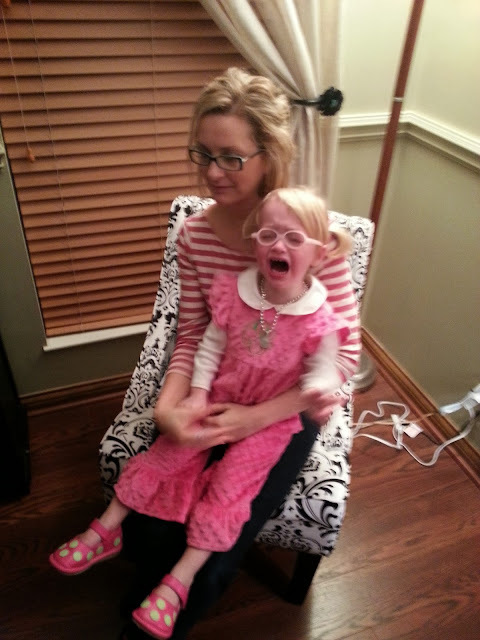 For Christmas this year, she got a wheelchair for the same doll. Pretty sure we've got a future nurse on our hands. In July I saw my 7th Rush concert. 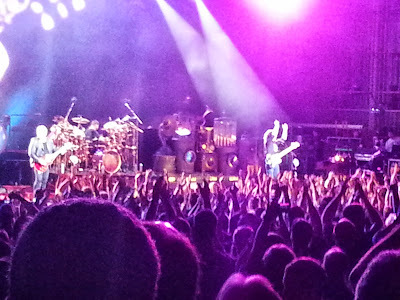 It was the second time I had seen them on the Clockwork Angels tour (the first time being in Indianapolis in 2012), but that first time I had been sick the whole time, so it was nice to enjoy the show without a raging sinus infection. 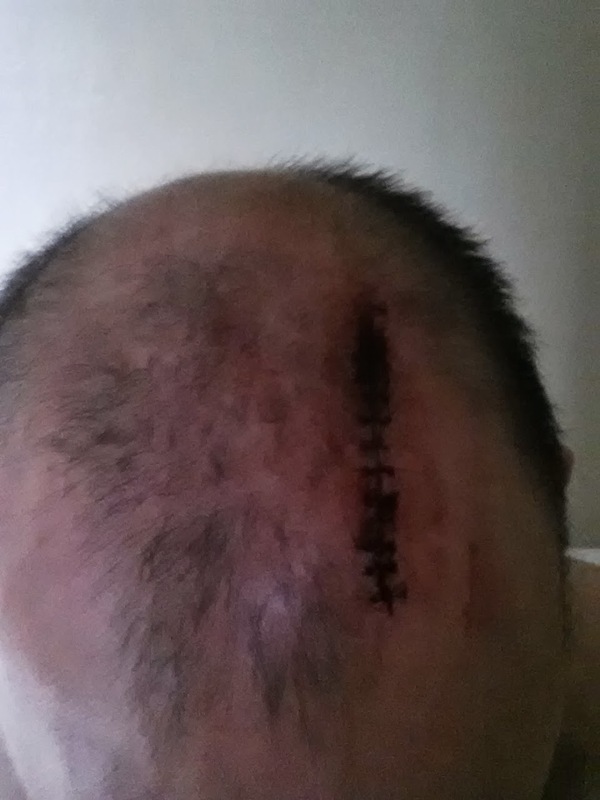 That's twelve stitches, if I recall correctly. Kind of a bad year for me. 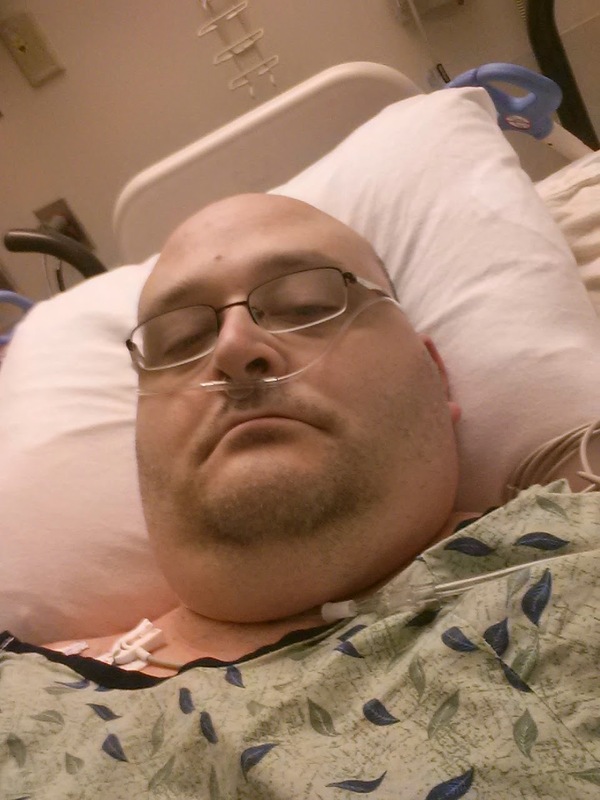 In October, I had my long-awaited nuclear stress test and echocardiogram. The stress test tests your heart's function during exercise and rest, and the echocardiogram tests how well your heart is beating and pumping blood. I passed both tests with flying colors - there was no abnormality in either. Six months down the road from a heart attack - even a "small" one - I was very happy with those results. I didn't even see my actual cardiologist at the follow-up appointment. I only saw the nurse practitioner - which means my case isn't "serious" enough to require a face-to-face with the cardiologist himself. He didn't use these terms, but I basically got a clean bill of health. Keep on doing what you're doing, and all that. Thanksgiving and Christmas came and went quickly and now here we are at 11 pm on New Year's Eve. I did make a little headway on my book about political parties this year - I even took off work 2 days in November to work on it - but I have not managed to get it finished yet. I did, however, lose a bunch of weight and stop smoking. Of the three goals, those were the two most important. I don't want to get too cheesy on here or be silly and sappy, but I have learned a few lessons this year. I said earlier this year that my heart attack had made me suddenly feel "older" than my younger friends at work. That's still true, but I also feel like I've grown a little wiser. Maybe grown up a little. I've started meditating a lot again - something that used to be really important to me, but which I had slacked off on in recent years. I feel more spiritually-connected, more introspective. In a way, I feel like I've learned a lot about myself this year. I'm more aware of what's important and what's really dumb and not important. I've had a number of "epiphany" moments this year, where I suddenly gained some new insight or clarity on a given topic. I've found that I'm less likely to be a push-over; less likely to let people walk all over me. That particular thing has led to a couple of "disagreements" with a few people over the last 9 months, but that's better than sitting on those emotions and stewing over them for days, as I frequently did in the past. In the end, I'm not sad to see 2013 go. I used to wear #13 in baseball, and always said it was my lucky number. Turns out, not so much. But I also realize that a lot of good has come out of my troubles this year. I'm thankful for what I've been through and where it has led me. I'm thankful for being healthy, fit, and feeling good. I'm thankful to be over my nicotine addiction. I'm thankful for my family and my friends, but especially my family. I've been promising all year to post before and after pictures of my weight loss. 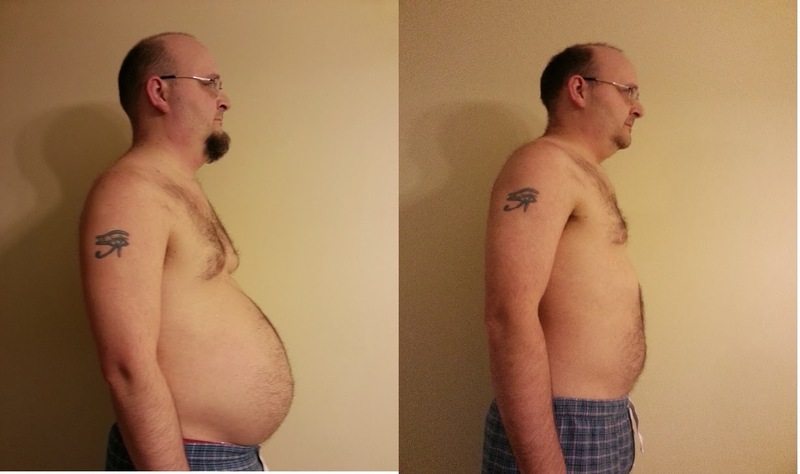 In January, when I started trying to lose weight, I took some "before" pictures, because I'm always thinking ahead. So tonight, I took some "after" pictures. I still want to lose a few more pounds; in fact, I've gained back a couple of pounds over the holidays. I was 204 this morning. Still, I weigh now about as much as I did when I was 25. So here you go. January 2013 on the left, December 31, 2013 on the right. Another great blog posting! Beautiful demonstration of what one can do with determination and commitment. Congrats on the weight loss! Even your beard lost a little weight~LOL! The above comment is Michelle Lyrene (Meyer)! Michelle, it's funny you mentioned that about my beard because another friend commented that it looked like I had GAINED chest and belly hair. I told her it's just that the hair is spread over a smaller surface area now, so it appears thicker :) Not so for my face, of course. Ha.